Planning for the first ever Twin Cities Veg Fest is well underway, but we need your financial backing to make this event a success. 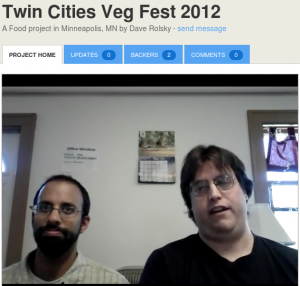 On July 14, we'll host our first ever Twin Cities Veg Fest. We need your help to make this event a success. Please check out our Kickstarter campaign, back this event, and spread the word. We need to raise $1,500 by June 15 to receive funding. We already have great exhibitors (we are welcoming more) and speakers, but we also need your financial support to make it happen! Your support will help us keep costs low for exhibitors, so we can have tons of cool exhibitors offering food samples, selling meals, and sharing information. We'll also have some great speakers, a kid's area, and a lot of fun.